Fueled by acts like Led Zeppelin, Deep Purple and Black Sabbath, a new breed of rock burst onto the scene in the late sixties. With a big, thunderous sound, often with the drums as the barreling force in the front of the mix, the classic acts of this era didn’t only strike a chord that would resonate to this day – they shook the ground and started a landslide of heavy music to come.It’s from this legacy that the Big Rock Drums EZX picks up. Helmed by Rival Sons’ drummer Michael Miley and Grammy Award-winning engineer Dave Cobb (Rival Sons, Europe, Zac Brown Band), it sets out to capture the raw essence of classic rock drums as we know them. Recorded at Cobb’s own Low Country Sound Studio in Nashville, it presents five essentially different kits that still share one common denominator – they’re the massive, reverberant and roaring type, tailored for big rock songs. 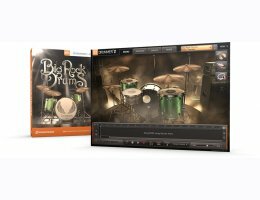 A working EZdrummer® version 1.2.0 or a Superior Drummer® 2.1 (or above) installation.